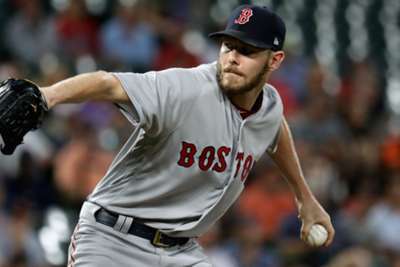 Chris Sale will not start game five of the American League Championship Series, with the Boston Red Sox ace now set to pitch in game six. Red Sox manager Alex Cora told reporters that Sale felt "weak" on Wednesday and needs more time to get ready after the starting pitcher was released from hospital on Monday following a stomach illness. Sale will now start game six against MLB World Series champions the Houston Astros – who trail 2-1 in the ALCS heading into game four – in Boston on Saturday. The seven-time All-Star threw four innings of one-hit, two-run ball in a game-one loss to the Astros. Sale finished the regular season with a 12-4 record and a 2.11 ERA with 237 strikeouts in 158 innings. Boston are starting Rick Porcello in game four on Wednesday, so Eduardo Rodriguez may be in line for the start in game five, while Joe Kelly and David Price are also options.